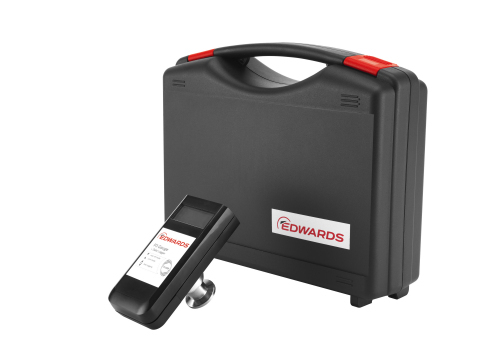 BURGESS HILL, England--(BUSINESS WIRE)--Edwards is introducing the P3 handheld vacuum measuring system. An easy to use, battery powered device with direct on-board display of measured pressure, which is ideal for on-site service calls and in-situ pressure checking. The P3 can provide mobile and fixed pressure measurement for installations of all kinds, including service, maintenance, universities or laboratory applications. The Piezo Pirani sensor enables pressure measurement of all common gas types, in the range of 1200 to 5x10-4 mbar. With the integrated battery, the device can be attached and operated at any pressure point, and directly display or store up to 2000 values – all data values stored can be exported via USB. Edwards is a leading developer and manufacturer of sophisticated vacuum products, exhaust management systems and related value-added services. These are integral to manufacturing processes for semiconductors, flat panel displays, LEDs and solar cells; are used within an increasingly diverse range of industrial processes including power, glass and other coating applications, steel and other metallurgy, pharmaceutical and chemical; and for both scientific instruments and a wide range of R&D applications. Edwards has over 4,000 employees worldwide engaged in the design, manufacture and support of high technology vacuum and exhaust management equipment. Edwards has state-of-the-art manufacturing facilities in Europe, Asia and North America.